Passover begins this year on Friday evening, April 22nd, 2016, with a Passover seder dinner. Passover is one of the three high holidays in the Jewish calendar and celebrates the Exodus of Jews from slavery in Egypt. 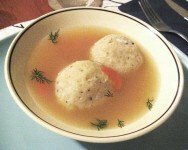 Let your students review fractions in this investigation on tripling my mom's recipe and trying to use the recipe to create one humungus matzo ball. Passover always begins on the 14th day of Nissan on the Hebrew calendar but that day translates to a range of Spring days in the Gregorian calendar. For an interesting investigation of the Hebrew calendar go here. From past years we had a more thorough fraction activity called Passover Macaroons.